Cardwell Hill Tr > Fitton Green N-S Tr > Allen Throop Loop and back | 5.7 mi | 500′ ele. gain | 1:45 hr. It was a beautiful day for a walk. I’d hiked at Fitton Green several times before, but always from the trail system at Bald Hill. Today I drove to the Cardwell Hill Trailhead to connect to the natural area from there. It was afternoon by the time I could pull myself away from my responsibilities. The sun was bright in the sky; it was a tank top kind of day. I walked up the trail, which was an old road, and passed by some photogenic, rusted junk on the side of the road. There was an old car turned on its side and some other big hunks of metal. Beyond that there were some massive oak trees with sprawling branches reaching up the tree trunk like ladders. I took a few minutes to climb around in the trees and then got on with my walk. Upon reaching the North-South trail, the ecosystem changed. A clearing appeared, with horsetail growing happily along the trail. I walked up a slight incline as the path climbed the hill. Fitton Green was mostly brown today. A large meadow filled with golden grass shone brightly in the warm afternoon sun. I stopped to enjoy the view at the top of the meadow before finishing the loop at the enormous oak. As I circled back towards my car I noticed the mushrooms and plants along the way. And as I made my way back into the cover of oak trees several turkeys scurried down the other end of the road. A delightful afternoon in the company of wild birds, old trees and fresh air. Oh summer, won’t you last forever? 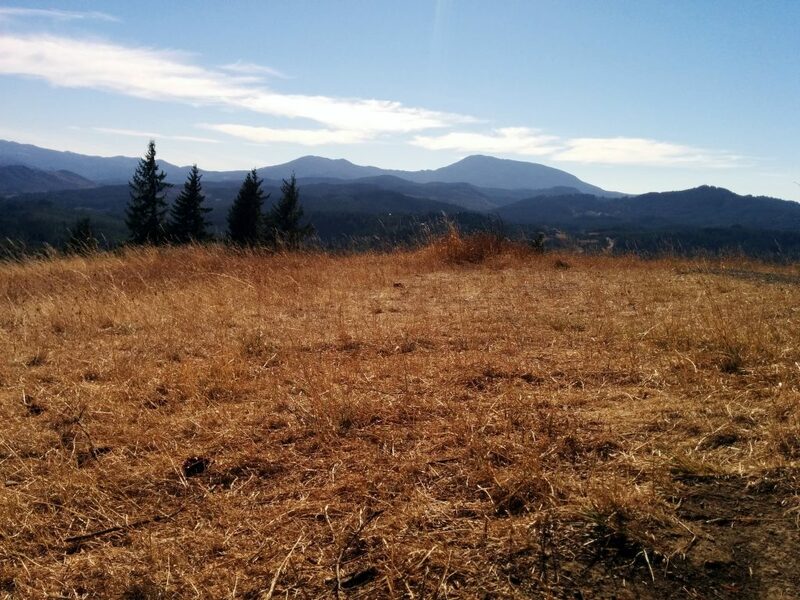 This entry was posted in Hiking, Oregon and tagged hike366 on September 12, 2015 by Jess B.